To tourists, the state of Vermont is known primarily for its rich maple syrup and great wintertime skiing. To urban Northeasterners it is the source for many of their dairy products. 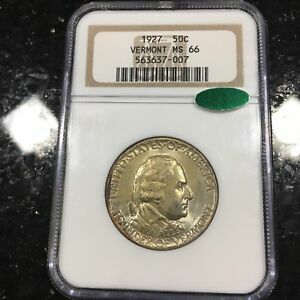 To numismatists, however, Vermont is famed for its two great contributions to American coinage, its charming copper cents of 1785-88, so rich in varieties and historical lore, and the Battle of Bennington/Vermont Sesquicentennial half dollar of 1927. The citizens of Vermont have always been fighters, fighting for their rights, their principles and, most of all, their cherished independence. Don't forget that Vermont alone, of all the New England colonies, chose to proclaim itself an independent republic when breaking with Great Britain. This situation lasted for some fourteen years, beginning in 1777 and lasting until Vermont ultimately acceded to joining the Union in 1791 as, coincidentally, the fourteenth state. Vermont was a relatively unknown and unsettled land until the middle of the 18th century. The French had made sporadic inroads for more than a hundred years, but most preferred to pass through this land in search of more promising pastures. English soldiers and settlers gradually came to predominate in the remote country, but it wasn't until 1741 that the British Crown finally appointed a royal governor for New Hampshire, including most of what would ultimately become Vermont. The new governor's name was Benning Wentworth, after whom the town of Bennington was named. In the 1760s, a boundary dispute between New Hampshire and New York posed the threat of armed conflict. Among those most ready to repulse the invaders from New York were a pair of brothers, both fierce supporters of New Hampshire's claims to the land, much of which they and their friends occupied. The Allen Brothers, impulsive, fire-breathing Ethan (1739-89) and his younger, more reasonable sibling Ira (1751-1814), were key players in Vermont's ultimate independence. It was the more aggressive Ethan, however, who quickly formed a militia which called themselves the Green Mountain Boys (Vermont is French for green mountain). Before war could break out between the colonies of New Hampshire and New York, the Battles of Lexington and Concord gave all concerned a common and far greater cause for which to fight - the independence of Britain's American colonies. Contrarians as always, the Vermonters could not come to terms with the Continental Congress in Philadelphia and chose instead to proclaim their land an independent republic. 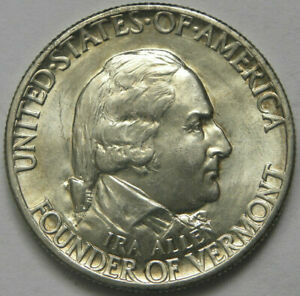 Thus was born the Republic of Vermont on January 15, 1777, in large part the creation of younger brother Ira Allen. Yet, it was Ethan's Green Mountain Boys who took their case to the battlefield on August 16, 1777. Under the command of Captain John Stark and Colonel Seth Warner, the Vermonters defeated a force of Hessian mercenaries in a battle that has been termed "the turning point of the Revolution." The victory was complete, and the British would no longer contest Vermont's independence. A 300-foot tall monument now marks the site of this historic battle. 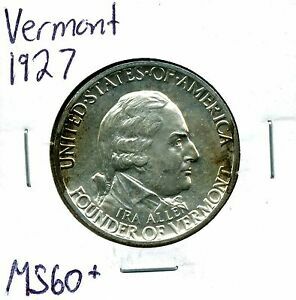 As the 150th anniversary of this struggle approached, the Vermont Sesquicentennial Commission sought a commemorative coin to mark the event in 1927. 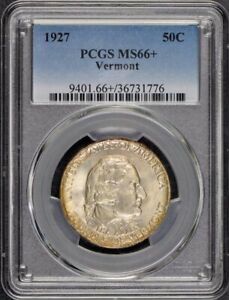 Unlike many such groups that had waited until the last minute to apply for their coins or had even gotten them back-dated after a celebration was over, the folks from Vermont appealed to their representatives in Washington as early as 1924. 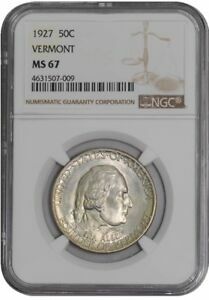 After much wrangling and deal-cutting, the Vermont half dollar was approved February 24, 1925 in a bill that also authorized the Fort Vancouver Centennial half dollar and the California Diamond Jubilee half dollar. 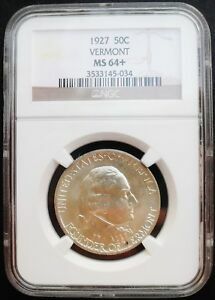 The fact that President of the United States Calvin Coolidge was from Vermont certainly must have weighed in its favor. 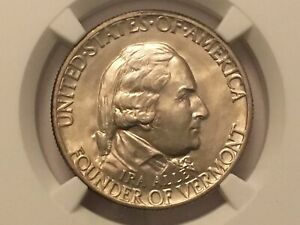 The original models for the Vermont half dollar by sculptor Sherry Fry portrayed Ira Allen and the Bennington Monument obelisk. These were disapproved by the Commission of Fine Arts' sculptor member, James Earle Fraser, of Buffalo nickel fame (Fraser was notorious for rejecting most designs that came his way). 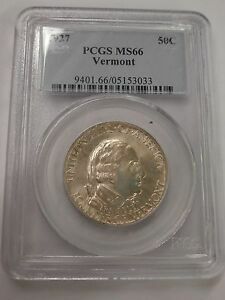 After a year of frustration during which countless letters were exchanged between the two bodies, the Vermont Sesquicentennial Commission engaged Charles Keck (creator of the 1915 Panama-Pacific gold dollar) to prepare new models. 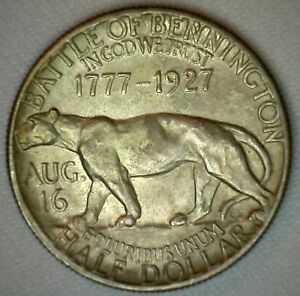 Of several furnished by the artist, his obverse of Ira Allen and his reverse depicting a striding catamount (mountain lion) were approved by the Commission of Fine Arts on April 29, 1926. Curiously, the catamount was a figurative substitute for a previously-rejected model by Keck displaying historic Fay's Tavern, known also as "The Catamount Tavern." Although an attractive element, the cat really has no connection to the coin's theme. 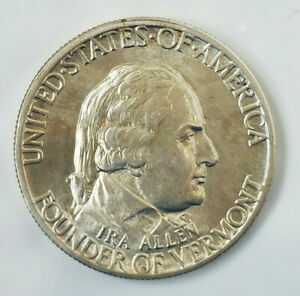 Honoring the 150th anniversary of Vermont's independence from Britain and the Battle of Bennington, the Vermont Sesquicentennial half dollar portrays on its obverse a right-facing bust of Ira Allen, his name and the inscription FOUNDER OF VERMONT placed below. Above his portrait is the legend UNITED STATES OF AMERICA. The reverse is dominated by a profile view of a catamount poised atop a mountain crag. In front is the date of the battle AUG. 16 and above the dual dates of commemoration 1777-1927. 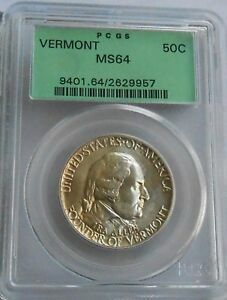 The words BATTLE OF BENNINGTON and the value HALF DOLLAR are arranged around its periphery. Crowded within the little remaining space are the statutory inscriptions IN GOD WE TRUST and E PLURIBUS UNUM. The artist's initials CK appear between the cat's left hind leg and the tip of its tail. The coins were approved early enough that great hopes were held for their sale. 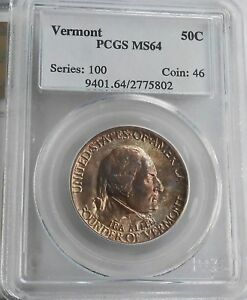 Since the Sesquicentennial Commission desired that these coins be sold primarily to Vermonters, a mintage of just 40,000 pieces was authorized. 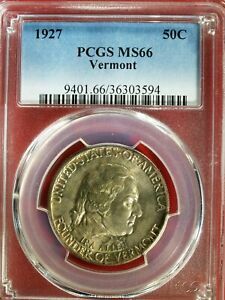 These were coined at the Philadelphia Mint, along with an additional 34 coins reserved for assay. Even with such a low mintage, some 11,892 pieces were ultimately returned as unsold and destroyed, leaving a net mintage for this issue of 28,108. Obviously, the speculative market in commemoratives was still some years away. 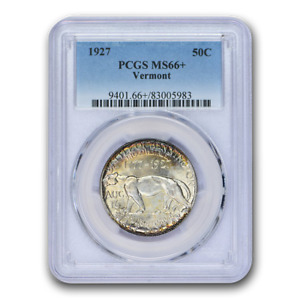 As most of this issue was sold to non-numismatists, the coins were rather carelessly handled over the years. Many will show light wear or signs of unskilled cleaning. 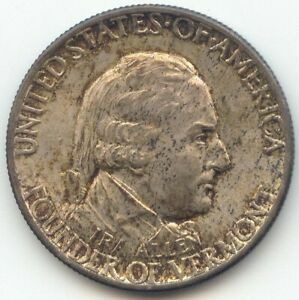 Aggravating this condition, some Vermont half dollars are not fully struck in the area of Ira Allen's hair at the upper-central obverse. 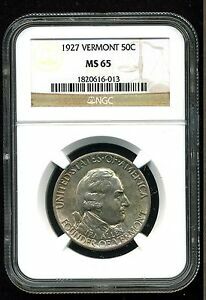 One matte proof coin was made to order for Chief Sculptor-Engraver John R. Sinnock, a connoisseur of such pieces; its details are sharp and complete. 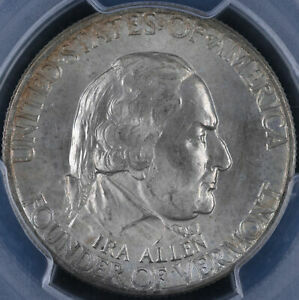 A small minority of the coins seen will show a diagonal die break on Allen's forehead above his eyebrow. 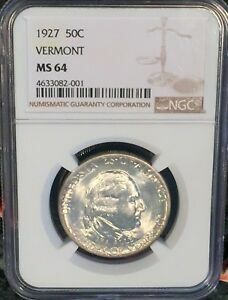 Part of the original mintage was distributed in custom card stock holders inscribed with the name of one of several distributing banks. These documentary items are of considerable value in their own right, with or without the coins they contained. 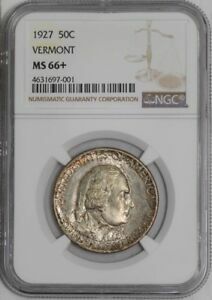 In the lower grades of mint state, Vermont halves may be found with little difficulty. Even in MS-64 and MS-65, a fair number are available, most with excellent, frosty luster. 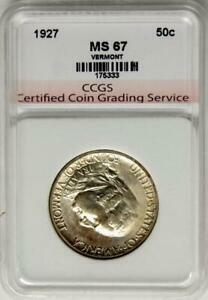 Top-grade examples in MS-66 and above are quite scarce, the high relief of this design inviting nicks and abrasions. Points to check for wear include Ira Allen's cheek and the hair at his temple; on the reverse, examine the uppermost part of the cat's foreleg and its hip. The greatest rarity of this commemorative issue is the fact that not one word of scandal, corruption or greed was uttered against it. 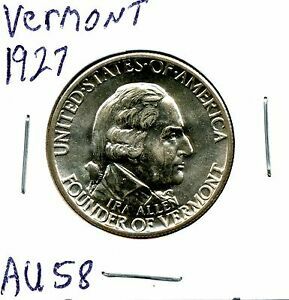 The coins were distributed equitably at one dollar apiece, sold primarily to residents of Vermont. The funds raised were set aside for the honorable purpose of studying Vermont's history. Collectors thus had no angry words for this program. Now that's something to commemorate!